After a couple of years paddling my Frej often (1 or 2 times/week) it is still my favourite boat! [...] The one surprising thing to me is the quickness (speed) of Frej. At first I thought it was my imagination, but time after time I have found Frej to be quick, especially for a 16-foot boat. [...] One of my regular paddling companions uses a Seda Glider which is considered a quick boat, and I can match his speed, even though he is fitter than me. I think that the low wetted surface area and the rocker help to keep the drag to a minimum; the boat really moves along. I finished your Frej design of this summer and have been delighted with the the kayak. It probably exceeds my expectations. Again thanks for such wonderful kayak designs. It turns and maneuvers extremely well, is smooth and solid in wind and waves, and with a little bit of the skeg down it goes in whatever direction it is pointed without any difficulty. I especially like the 2 rope skeg control. A couple of years ago I began sketching for a new sea kayak, based on the Njord, but shorter and more maneuverable for surfing, playing in waves and touring in rough conditions. For different reasons, I quit halfway – primarily because I was so satisfied with my Njord, and more so for every year. I found the maneuverability so excellent that I did not see the need for improving this at the expense of speed. "Hei Bjørn, har sett litt på noen nye kajakker som er komt på markedet, kan nevne PH Delphin,Tiderace Extrem,ser ein tedens til litt meir spesialiserte kjakker til bruk i større sjø og surf,hadde vert spennende å sett dej designe ein slik type kajakk,å lagt ut tegniger for salg og bygging. Har du noen komentarer til eit slik forslag?" (My translation: "Hi Bjorn, have been looking for the new kind of kayaks, appearing on the market, PH Delphin, Tiderace Extreme to name a few. See a tendency towards kayaks specialized for rough seas, surfing. Would be nice with such a kayak from your drawing board, with plans for sale and home building. Comments?" Furthermore, I designed the Discovery for Seabird Designs. Though shorter and wider than my initial sketch, it was received with (to me and my love for narrow and fast craft) surprising enthusiasm*, and one reviewer recommends the kayak for the very same purposes I had in mind. So in 2011 I opened the sketches from the forgotten-ideas-folder and started playing with the hydrodynamics. Most was already done: starting from the Njord hull I had reduced the length from 559 to 507 cm, increased the beam from 51 to 53 cm, increased the keel rocker and lifted the stems slightly (a shorter kayak risks dipping the stems in steep seas more than a longer). So far so good. I aimed for approximately the same displacement as Njord – 130 kg – but ended up a few kgs over that, when I was satisfied with the other hull data. Frej är den bästa kajaken jag paddlat, grymt följsam och lättrollad. Jag är helt nöjd! Stability: I wouldn't hesitate to put a beginner in this boat- it is very 'quiet' in the water- good initial stability. I had no trouble paddling with my knees in the middle of the cockpit ('sorta K1'style). The boat feels very predictable on edge as well. When I was playing around with re-entries, I could easily sit on the back deck with a few inches of water in the boat, and paddle around. Tracking: I definitely felt like the boat was 'sitting on top of the water' and it was easy to spin it around 180 deg with a sweep and a bow rudder, even with little speed. Hanging draws were easy- throw the paddle in anywhere around the cockpit and the boat moves sideways - no searching for that 'magic spot'. However, it was pretty easy to manage when paddling forward. Skeel: I like it a lot. This boat and the skeel are a great match, I think. An inch or two of skeel and the boat is still very maneuverable but goes where it is pointed with no fuss. Re-entry: I was a bit concerned that the low deck aft the cockpit would get too close to the water when doing a cowboy/scramble re-entry. Not a problem at all. Even with 3 inches or so of water in the boat, there was lots of freeboard aft. In rough conditions, it's always easy to get water slopping into the boat (in my limited experience) but I don't think it would be any worse in the Frej than in my Romany, for example. This would be a great boat for teaching cowboy re-entry as the low back deck is easy to slide up on. Rolling: I'm a beginner roller (sweep roll with layback-style finish), but the Frej certainly snaps right up - comparable to the Romany, or perhaps even a bit easier with the low aft deck. Speed: It felt quick for a 16-foot boat, but I was alone and didn't have a GPS, so no data there. There's a fair bit more waterline than on the Romany, and it did feel like it was quicker ...but I may have been a bit more 'hyped' with the new boat. It feels like a lot of fun, and I would put a beginner or especially a smaller paddler in it without a second thought. Another statement on Frej's rolling qualities came from Andreas Holm, Denmark, when he in this video quickly performed all the 34 Greenlandic competition rolls in a standard composite Frej! An almost flat bottom in combination with rocker means that the kayak turns very easily, while the sharp midship chines give control over maneuvering. Volume and the rounded bottom in the extreme ends add positive floatation for surfing while moving silently and smoothly through the waves. The vertical stern adds direction stability at speed, balancing the maneuverability when needed. The deck/cockpit configuration is developed from some years of experience with Njord – combining a very low sheer and a comfortable aft deck with minimal windage and a rather good volume under the aft and fore decks. 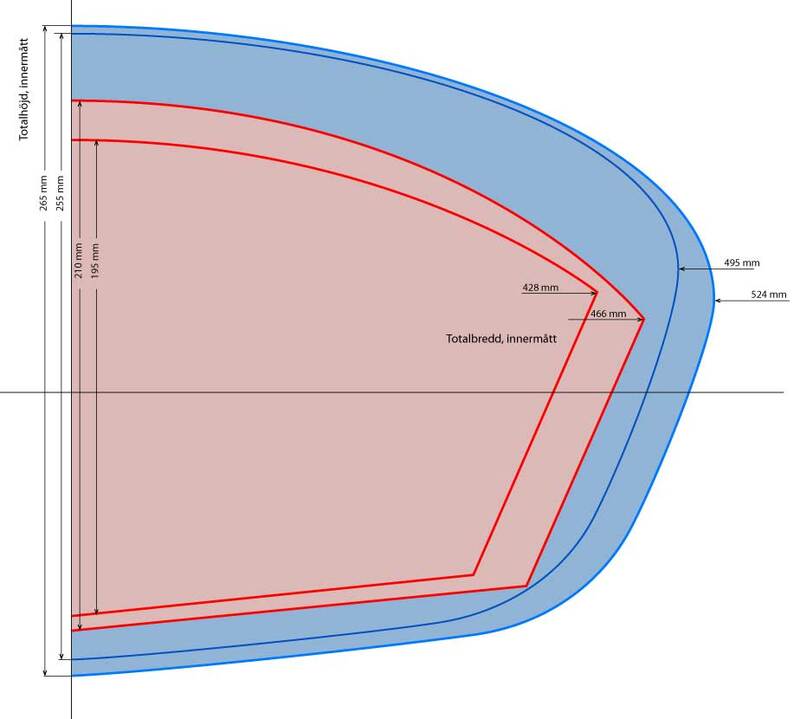 After some suggestions I have designed two additional sizes for Frej – one smaller for paddlers under 70-75 kg and one larger, for paddler over 85 kg. Kayaks, in general, have a very large margin when it comes to load capacity. 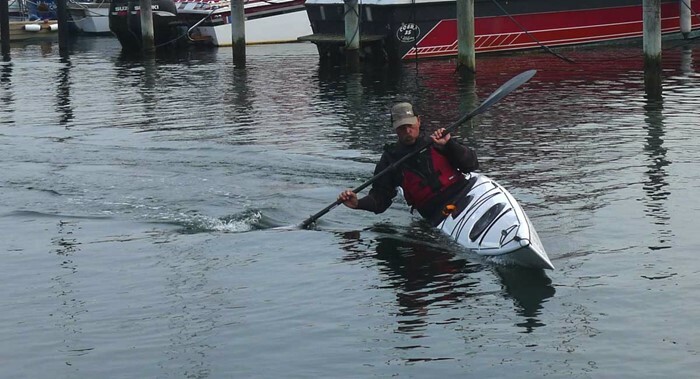 It takes approx 16-17 kg to sink or lift a Frej 1 cm on the waterline – which means that the different versions will be usable far outside the weight limits for certain purposes: a smaller kayak may be a very relevant day-touring kayak with exceptional kayak control, while a larger kayak will provide generous capacity for long distance touring – but will float high in the water if used for day-tours. Please note when ordering, which one you want. Safe and comfortable touring at sea, along coasts and in larger lakes. Advanced paddling, rockhopping, rolling etc. Excercise and day trips. The increased rocker places the paddler deeper in the water and lowers the Cp considerably, and to compensate I worked a little more volume out in the stems. Thus, Cp decreased no more than from 0,56 to 0,52. This means that the efficient speed range is lower than Njord's, which might be appreciated by most of the potential builders: Frej (blue curve) has less resistance in speeds below approx 8 km/t (4,3 knots), while Njord (purple curve) wins at higher speeds. The extra volume also helps keep the stems from diving in steep seas. Frej turns quicker than Njord – the rocker, sharp midship chines, and the rather flat bottom combine to give quick and precise maneuvering for surf and play. To balance the maneuverability the stern is shaped to give a directional stability proportional to the speed – but for long distance touring it still needs an adjustable skeg. I have no doubt whatsoever that Frej will be a highly competent partner to paddlers who like big water play, surfing and tough touring in whatever conditions that might be encountered. Interesting is that I succeeded in minimizing the wetted surface in relation to the displacement (and thereby the friction) to a very low figure, in spite of the sharp chines. Relative the mathematical minimum for a 135 kg displacement, the underwater area is at no station position more than 6,6 % over – promising a quite fast and easily driven hull in its class. Safety is handled as in Njord. Rolling, support braces, balance brace etc is cheatingly simple: a little more stability to overcome during rotation, but better secondary stability helps in the final stage – and, of course, the low sheer midships and aft deck is inherited from Njord, facilitating stroke dynamics in paddling, rolling and maneuvering. Better overall stability means that it is easier to climb back into the cockpit after a wet exit, for non-rollers. "Get out onto the water with ease: the Discovery provides it all in one neat little package! The kayak is responsive and stable; plus it features a distinctly shaped hull great for bridging a wide choice of day trips. The Discovery is light and very easy to handle, additionally providing extra fine-tuning options for meeting your personal preferences. This mini sea kayak is exactly what you need for exploring open, choppy waters on the sea; the lull of lazy rivers and wild beauty of lakes. The Discovery likewise features the SeaBird Power Pedals string system. Pedals on the kayak's leg rail can be adjusted by 15 cm in either direction and allow you to fit the kayak's steering capability precisely to your individual needs. Thigh braces can also be regulated by ten centimeters". The very positive reviews of Frej interested the well-known Danish company Struer Boats. To satisfy those who can't or won't build their own kayak we decided to develop a production version. From the start we agreed on that nothing should be changed. This was to be a Frej – not some watered-down commercialized look-alike (a suggestion I have heard a couple of times from other companies!). The only change is that a composite kayak will be heavier than a wooden one – but, on the other hand, you don't have to spend some 150 hours in the workshop. March one, 2015 Petrus Johansson (Petruskajak) handed over the wooden plug. In June we could test the first production kayaks. During the summer all kayaks were preordered and were sold more or less directly from the truck. In September we begun to catch up – more kayaks produces than preordered and decided to show it at a major kayak event in Denmark. The composite Frej is a "real" Frej without any marketing or production compromises. It is targeted towards discriminating paddlers in the same category that otherwise would choose to build their Frej. After having tried out several kayaks the last two weeks, hunting for a kayak with both maneuverability, speed, solid edging and good capacity, Frej was on top. Other kayaks I tried were Skim Beaufort, Valley Nordkap Forti and Nordkap traditional and Etain, Sterling Illusion, Zegul Arrow Play HV, Seakayaking's Explorer and Romany. Of course, paddlers have different preferences and the final choice is subjective. But Frej has a huge potential and I look forward to pushing the limits in all kinds of weather. Just got home from nine days on the Helgelandskusten in Norge, bringing three Frej. The photo is of Traena Hawaii (The north sand island) with the Traenastaven in the background. The kayaks are fantastic. Two beginners had no problems handling them in wind and waves. Easily maneuvered and take a good amount of camping gear, easy to control in surf and on flat water. And good looking as a bonus! I have been waiting impatiently for Frej. in the meantime I have read everything I could find about Björn Thomasson's design. And in spite of that, I was positively surprised. I am looking for a new kayak and have tried some – among others Arrow Play, Arrow Nuka, Rebel Greenland T, P&H Cetus LV, Tiderace Xcite S, Valley Avocet and NDK Pilgrim. Frej is a fun kayak. Are you into rolling you will love Frej! Frej reacts far better to edging and turning strokes than any other kayak I have tried. It goes around the corner just by edging. Roll training is fantastic in Frej. You have a superb contact with the kayak, and rolling is really easy. Frej feels stable, in spite of being a lively and fun kayak. I was initially worried about tracking and room for gear. And here Frej really surprised me. It's like the closet in Narnia ;-) It swallowed all my gear + some more. And I have, as always, brought too much. On the water, I tried several positions with the skeg. Without the skeg, it is hard to stay on course. With the skeg slightly down Frej tracks beautifully. At some occasions, we had current from one direction, waves from another and wind from a third. But with the skeg in an adequate position, I had no problems whatsoever to stay on course. The speed was quite good. I had no problems keeping the pace of my male paddling companions. As a perfect finish of a lovely tour, I hand-rolled Frej ;-) I have only managed one handroll before: in a Greenland kayak, in an indoor pool with an instructor guiding me. Later attempts have failed. Now I nailed two successive handrolls. No doubts anymore – Frej is my next kayak. ...and a proud owner scrutinizing his new Frej on video, and another one. Is it easy to roll? As told above, Frej is developed (not very far) from Njord – a slightly shorter, slightly wider, a little more rockered Njord. The background, therefore, is essentially the same. Frej was designed in February 2011, and the name felt relevant: Frej was, in the Norse mythology the son of Njord, the Vanir God of the sea, the weather, the fishermen and the merchants of the sea. Äntligen! Frej ser ut att vara en kajak helt i min smak, skulle gärna provpaddla den. hoppas på att kunna få loss lite tid redan i veckan. Har en rolig idé på en surfkajak som jag tänkte yppa för dig, säkert alldeles tokig, men i min värld tänkvärd, i din kanske värd ett gott skratt..
Hej Måns, det finns ännu ingen färdig Frej att prova. Hej Björn, bygget av Frej går ungefär som planerat. Även om jag lyckades bli den första som köpte ritning så lär sjösättningen dröja till våren. Har i sommar dessutom köpt en begagnad black pearl (av Janina i Malmö) så det har varit ett lätt val mellan paddling o bygga i garaget. Gick förresten fantastisk bra att ha en BP som däckslast på segelbåten. Hursomhelst, jag tänkte skriva en rad att jag nog hittat ett mått som känns skumt på ritningen. Akterkant sittbrunn är lite för om spant 8 men måttsatt till 230cm, borde vara mindre, 230cm är ju nära spant 7. Eller har jag gjort mindre rätt nånstans? Tänkte sätta sittbrunnen precis där däcket börjar stiga (dvs som det ser ut på ritningen och det blir nog runt 204cm. Dessutom får jag väl erkänna att jag ändrat lite på Mästarens ritningar. Tyckte att bulan på akterdäck blev för markerad så jag minskade den något. Du har helt rätt, 230 måste vara en felskrivning på den eller de första ritningskopiorna. Lite drygt 200 bör det vara. Bulan på akterdäck är en kompromiss mellan estetik och mer lastutrymme – dessutom lite besvärlig att ribba – så ditt "tilltag" är en bra idé. Jag tycker Frej är en otroligt vacker kajak (helt oavsett namnet). Jag undrar lite över angiven fart: "8,5/10,7 km/h***". I din tabell har du en "Speed 1" och en "Speed 2", och står det 7,3 och 10,5. Men i tabellen finns ingen enhetsangivelse (eller så hittar jag den inte). Det är en viss skillnad på marchfart 7, 3 och 8,5, om nu båda är km/tim. Finns det någon förklaring som jag missat? Fartvärdena är mycket inexakta, eftersom datorapplikationerna bara ger ungefärligt totalt motstånd i olika farter. Jag får sedan gissa vilken styrka en "normalpaddlare" har och hur mycket av den styrkan som kan antas var rimlig att använda för att hålla marschfart – mycket gissande ;-) Normalt använder jag värdena från designprogrammet initialt för att sedan justera efterhand som kajaken är testad i verkligheten (jag använder Kaper, som ingår i många marina designprogram och som de flesta tidskrifter refererar till i sina tester – lite mer om Kaper och andra beräkningsprogram här). Är nyfiken på ett kajakbygge framöver. Vad skulle du säga är de viktigaste likheterna/skillnaderna mellan Frej och Isfjord? Såväl hantering, uppförande som användningsområde är av intresse? Tolkar jag stabilitetskurvorna rätt är Frej vesäntligt stabilare? Är Isfjord mer extrem än en "typisk engelsk havskajak" tex NDK Explorer? Frej är mera stabil genom att paddlaren sitter djupare i vattnet och får tyngdpunkten lägre (men ingen av kajakerna är på något sätt superstabila: de rör sig mjukt och fint i sjögång och det är inga problen för paddlaren att helt kontrollera rörelserna). Men framför allt är Frej mera lättmanövrerad och lättrollad, men tappar lite toppfart jämfört med Isfjord. Isfjord är i grunden en rätt typisk engelsk havskajak, men upplevs som livligare med bättre manöverbarhet, acceleration och fart genom att vikten normalt är en hel del lägre än för en vanlig glasfiberkajak – samma fördelar som Frej får gentemot de glasfiberkajaker i vars anda den är ritad: Tiderace Extreme, P&H Delphin m fl. Är skädda alltenativ roder ett måste på Frej. Frej bör ha en justerbar skädda, dels för att kunna justera egenskaperna från extremt manöverbar lekkajak till kursstabil tur- och långfärdskajak och dels för kontrollera upplovningen i sidvind. Roder är däremot olämpligt eftersom det försämrar manöveregenskaperna i låg fart och alltså berövar Frej halva sitt register av egenskaper. Grovt generaliserat gäller att skädda hjälper lättmanövrerade kajaker att hålla kursen och roder hjälper kursstabila kajaker att svänga, och att båda fixar problemet med upplovning, fast på olika sätt (skäddan hindrar upplovning genom att justera lateralplanet – rodret döljer problemet genom att införa en motgir). Lene, att välja kajak är ett rätt personligt beslut, som beror på var du tänker paddla, hur du tänker använda din kajak, vilken ambition du har för framtiden mm. På sajten finns mycket information som hjälper dig att hamna rätt. Men vill du chansa kan du bygga en Kavat – det blir sällan fel. You give me are real headache, first I saw Njord beauty whit out exception, love one first sight, then I start to browse little more on your site and stumble upon Frej. I read all the date for dozen of time and could not make I choice between Nord or Frej. I know you do not like to suggest but give me a hint. I am 178 cm high, 78 kg weight, expiriance less then zero but hungry. Here in Belgrade we do not have sea, just Danube river as largest water, few more rivers look like Danube, lakes and one or two fast river Drina is one of them. What would be your choice, almost forgot to say, need for weekend touring with tent - paddle for pleasure. I would chose a Njord – but that´s me: slightly hooked on speed and distance-paddling in all kinds of conditions. Recensionen på playak som du har här ovan anger att kajak som inspirerade dig att rita denna (Frej) är bra för fiske och andra "extra-kayaking" aktiviteter. Är detta något även Frej duger till, självklart förutsatt att man lär sig paddla någorlunda innan? Jag överväger att börja min paddlingskarriär i en Frej, är det möjligt? Det är en väldans fin sida du har förresten. Bjorn, what do you think it would be like if Frej was shortened to 5m or even a bit under? I wonder because of the new range of shorter kayaks being released as play boats. Could we do the same thing with Frej? Bohdan, with Frej I have built touring capacity into the play-boat concept with a substantial load capacity of 135 kg. Used as a dedicated play-boat you would need just a little more than your weight plus the weight of standard safety gear a little margin for safety, and thus you could shorten Frej almost as much as you want – at 420 cm you still have more than 105 kg on the design waterline. Something in between might make good sense – a short playboat but still usable for touring with a light load. Har nu i tre år med stor glæde roet (desværre for lidt) i din Sea Pearl med min tredie hjemmegjorte grønlandske pagaj. Skal aldrig ro med andet. Nåede lidt før min 70 års dag at få lært mig at rulle, uden dog altid at kunne komme op om det mislykkes! Hvis Qanik var kommet, ville jeg nok have prøvet den. Hvor ligger Sea Pearl i forhold til nogle af dine andre kajakker? Var der en som ville være ideel for mine 65 kilo og 172 cm's højde? Jeg er meget glad for manøvredygtigheden, farten, den lave vægt, men måske ligger den lidt højt i vandet med min ringe vægt, hvilket, tror jeg, gør rullet lidt vanskeligere. Black Pearl vil nok være for levende for mig. Fantastisk hjemmeside for alle kajakinteresserede! Tak for dit store arbejde til glæde for os andre. Seapearl är i grunden en Black Pearl, utspädd med några matskedar havskajak: lite mer stabilitet och lite mer lastkapacitet och lite mindre utmaning. Black Pearl LV är nog den som passar dig bäst om man ser till enbart vikt/deplacement – men annars är Seapearl ett bra val. Bygger du en kajak har du större möjligheter att optimera passformen. Jag har länge kollat in Isfjord, men nu tror jag att Frej är den kajak som jag bör satsa på, så vida jag inte är för " klumpig", jag är 180 och väger ca 84 kg. Eller är det Njord som passar mig bättre. Det är inte så stor skillnad mellan Njord och Frej och de gör precis samma jobb i samma förhållanden – men Frej har en svag tendens åt lek-surf-hållet medan Njord lutar en aning åt fart-distans. Hejsan, har nu köpt ritningar till Frej, vill bara kolla med dig om jag är helt ute och cyklar om jag bygger en Frej utan skädda och luckor. På min nuvarande kajak har jag varken roder eller skädda vilket jag kan leva utan (inget som krångla). Jag håller i grunden med dig – ju mindre tekniska lösningar desto bättre – en lättare, enklare och mera pålitlig kajak. Så såg mina första kajaker ut (Nomad t ex). Men det finns några problem med Frej i förhållande till dina funderingar. Det är svårt att hålla ihop Frejs lite spretiga prestandaprofil utan skädda – att samtidigt vara en extremt lätthanterad lekkajak och en lugn och sjösäker långfärdskajak för alla förhållanden. Du kommer att bli irriterad på upplovning i sidvind (som du får lösa genom att paddla långsamt) och lite för lite kursstabilitet vid distanspaddling. Det andra är att akterkanten av sittbrunnen är mycket låg för att kajaken skall vara lätt och bekväm att rolla. Det är därför inte lätt att packa bakom sittbrunnen. jag behöver ju inte använda den om det inte är absolut nödvändigt. Och en lucka i aktern, förut går det att stuva in ändå. Då har jag ändå fått en maximalt utnyttjande av kajaken med minimalt håltagande. Det är av flera skäl olämpligt att ha skott bak men inte fram. Det viktigaste är att om det uppstår en läcka (och risken ökar såklart för varje hål man tar upp) så kommer kajaken att bli farligt ohanterbar på grund av att den läckande änden sjunker och den motsatta pekar uppåt. Lösningen kan vara att antingen ha en lucka bak men inget skott, eller sätta ett löstagbart skott framför fotstödet (har provats av många byggare, t ex med ett ringspant och en lucka med någon sorts låsning tätningslist – men kruxet är att det är lite svårt att nå luckan om du inte också har ett stort sittbrunnshål). En tredje lösning är en lös flytsäck i förskeppet – det finns (eller fanns) en strutformad variant med en mellanvägg, där man packar i ena facket och blåser upp det andra så att den fyller ut i förskeppet. Jag får klura lite till på vilken variant det får bli. Men du ska ha många tack för dina synpunkter, de är guld värda. Detta forum är en fantastisk möjlighet att kunna bolla olika idéer med konstruktören. För det du inte vet är inte värt att veta. Jag och en kompis byggde ihop varsin Frej under vintern som var och blev klara i somras, mertiden med luckbygget är inte så stort men fördelarna överväger, skotten stabiliserar ju även upp kajaken ngt(kändes iallafall så) och skönt att kunna packa i, skär du själv upp hålen så kan du ju själv bestämma storleken på hålen. att lätt kunna tömma den genom att ha bakre skottet nära sittbrunnssargen var ett klart pluss märkte vi båda då vi lekte lite väl mycket i vågorna:). + att frej är högre framtill vilket ger mer plats för fötter och viss positionsändring. Då har det nog inträffat olinjära avvikelser i cyberrymden – jag hittar inget mail från Dag Ericsson heller. Men tack för de bilder du har skickat nu. Funderar på bästa lösningen för slangkopplingen i skäddaboxen. Är inne på en slangnippel i plast (tror att metallnipplar sliter hårdare på tamparna) i själva genomföringen mellan box och slangar för tamparna. Jag har varken testat plast eller metall – Jag har bara byggt två kajaker med skäddreglage i slang, och i båd fallen ruggade jag upp slangänden med grovt sandpapper och limmade in den. Det gick sådär – den ena gången pålitligt tätt, den andra läckte och orsakade mycket onödigt extrajobb. Jag skulle inte bekymra mig om eventuell skillnad i slitage på linan – så mycket trixar man inte med skäddan. Är finishen bra (inga gjutgrader eller vassa kanter) duger både plats och metall. Den slang jag använt är en ganska styv polyamidslang för vacuum, pneumatic etc: 8 mm ytterdiameter, 6 invändigt. Men även slangar i silikonmaterial bör fungera bra. Kan det lade sig gøre at bygge en Frej på omkring 4 meter. Så kan den være i mit kælderrum inde i København hvor jeg bor. Har lavet en Frej på 490 cm som jeg er meget begejstret for, især dens surfegenskaber, men den er parkeret et stykke fra mit hjem. Derfor dette ønske om en meget kort model. Ja det bör inte bli några problem med det. Lastkapaciteten minskar förstås från 135 kg för en Frej enligt ritningen (507 cm) till ca 106 kg för din korta version. Vidare sjunker farten en liten aning (med roten ur längdändringen) och stabiliteten blir en aning mindre (den totala "sittytan" i vattnet minskar en aning – fast längdändring betyder inte alls lika mycket som breddändring). Vill du behålla lastkapacitet och stabilitet bör du alltså bredda kajaken lite (tre-fyra centimeter) – vilken kan göras i t ex en kopiator där längd- och breddskalan kan justeras individuellt. Sittbrunnen flyttar du tills sitsen hamnar procentuellt lika långt från akterstäven som på normalversionen. Tack for svaret. Det lyder lovende. Jeg har lige et et spørgsmål til. Når jeg korter kajakken til 416 (13 x 32) bliver köllinjen mycket krökt. Måske Borde den inte vara så krök? Håber du forstår mit "svenska". Jeg lægger 6% til i bredden så den bliver lidt over 57 cm. Krökningen i kölen har ingen större betydelse, under förutsättning att monterar en justerbar skädda. Kajaken blir bara lite mer lättsvängd med skäddan uppfälld (egentligen onödigt eftersom Frej är mycket lättsvängd även i fullängd, men inte heller något större problem). Eftersom Frej i originalutförande är både en trevlig lek- och surfkajak med suverän manöverbarhet i alla förhållanden, och en bra långfärdskajak med kursstabilitet och mycket bra glid, blir skäddan det som håller ihop den här tämligen spretande prestandaprofilen. Det är sådana detaljer som jag med varm hand överlåter åt mina kajakbyggarkunder – framför allt för att det den vägen kommer så många bra idéer som jag hade missat om hade varit alltför amerikanskt detaljkategorisk. Jag har använt många olika varianter utan att märka någon avgörande skillnad: rostfri axel (tungt med den är bara ett par centimeter lång), nylonstång (också lite tungt), aluminiumrör (bra, men med lite korrosionsrisk), kolfiberrör (kanske det bästa) – men jag skulle undvika en träaxel, eftersom den inte är dimensionsstabil i fuktig miljö. Jag brukar montera axeln fast i trumman (helt inkapslad, inga bultar och muttrar som kan läcka), och skäddan formad så att den går att trä på axeln utan att någonting behöver lossas. Jag hittade ett rostfritt rör 6,2mm troligen kvarttum. På det passade 8mm tryckluftslang perfekt. Det får bli så! Jeg veier i dag ca 100kg, 180 høy. Hvordan passer da denne kajaken meg, mtp lastkapasitet osv..
Det beror på hur du vill använda den. Som dagturskajak för lek, surf, roll mm fungerar den utmärkt, men vill du paddla längre turer med full packning bör du förlänga den (öka avståndet mellan spanten när du sätter upp dem) – till kanske 533 eller 546 cm (2 resp 3 cm extra mellan spantmallarna). Spontant tycker jag att Frej och Inuk är ganska lika i skrovformen, stämmer det? Det finns några utseendedrag som är snarlika (t ex formen på stävarna) men i övrigt är det två helt olika kajaker. Frej har en krökt köllinje och är kvick, lättmanövrerad och mångsidigt användbar, och med en justerbar skädda för att kontrollera manöverbarhet/kursstabilitet. Inuk ingår i en äldre (brittisk) tradition med rak köllinje och stor kursstabilitet – effektiv för snabb distanspaddling men utan Frejs mångsidighet och lekfullhet. Frej är mera släkt med t ex P&H Delphin, Tiderace Pace m fl, som har fått in lite manöverbarhet från surfskis i skrovformen. Inuk har genom åren tillverkats av flera olika företag: bl a Kirton, Nelo, Seabird, med högst varierande kvalitet. Men nu har Rob Feloy tagit fram en helt ny modell och tar själv hand om tillverkning och försäljning – den heter Inuk Ultra 20 och är längre, aningen bredare och har lite mer böj i kölen – är alltså förmodligen både snabbare, stabilare och mer manövervillig än den gamla. After a couple of years paddling my Frej often (1 or 2 times/week) it is still my favourite boat! Usually I paddle it with the 'skeel' (skeg just behind the cockpit, an idea from Reg Lake) partly down, as Frej is so easy to turn with the skeel 'up'. The one surprising thing to me is the quickness (speed) of Frej. At first I thought it was my imagination, but time after time I have found Frej to be quick, especially for a 16-foot boat. For example, I was recently in a class where we were paddling 'interval training' (3min, 30 sec rest, repeat x3, etc..) and I had no trouble 'keeping up' with the others, most of whom were a lot younger (and fitter) than me, and paddling good boats (Nordkapp LV, and a Romany-type). One of my regular paddling companions uses a Seda Glider which is considered a quick boat, and I can match his speed, even though he is fitter than me. I think that the low wetted surface area and the rocker help to keep the drag to a minimum; the boat really moves along. For camping trips, my new Panthera is the right boat; for day paddling, it's Frej 90% of the time. Thanks for the review John. I am glad to know that Frej seems to live up to your expectations – and mine. I had a Seda Glider experience a couple of years ago in my Njord. A friend of mine, a very competent paddler, younger, fitter and much much stronger than me, challenged me frequently for short races when touring. It ended mostly in a tie, and if one of us manages to get ahead, it was by less than a meter. För ett tag sedan skrev du om att Petruskajak gjort en plugg på Frej. Som skulle börja tillverkas i Danmark. Hur har det gått med det projektet, har de kommit igång? Jeg har bestemt meg for å bygge meg en kajakk. Før jeg bestiller tegninger fra deg har jeg et par spørsmål. Etter å ha lest en del om dine kajakker har jeg vurdert Frej til mitt førstevalg. Jeg anser meg selv som nybegynner da jeg i hittil kun har padlet en stødig fiskekajakk. Jeg skal hovedsakelig benytte Frej til rekreasjonspadling på innsjøer og kanskje litt sjøfugljakt langs Oslofjorden og skjærgården langs Sørlandet. Det kan vel også bli noen korte turer over 2-3 dager. Er Frej et bra valg til denne bruken? Jeg lurer også på om det er mulig å forlenge cockpitåpningen da jeg synes den er litt i korteste laget. Har prøvd kajakk med såkalt nøkkelhullsfasong på åpningen noe jeg synes var bekvemt i forhold til inn- og utstigning. Jeg er 178 cm og 90 kilo. Forøvrig vil jeg takke for din gode hjemmeside med mye nyttig informasjon. Tack Jan. Ja, Frej kommer att fungera utmärkt för dina ändamål. Sittbrunnsöppningen utformar du som du vill. Två storlekar finns på ritningen, plus anvisningar om hur du ändrar efter egna önskemål. I'm super interested in building one of your boats but am struggling between the Frej and the Njord. I have 30 years whitewater experience and have recently got into sea kayaking. I'm 75kg and 180cm tall. I love playing the sea especially shooting gaps through rocks and picking up runs on waves. In Tasmania, Australia (my home) we have some fantastic coast with large sea caves, massive cliffs and huge swell at times. I have just completed a 2 week south west trip and loved it. In that trip I realised the virtue of a stable sea worthy boat that can still move along at good speeds. I borrowed an Eco Bezigh (slowish but stable and reliable) for the trip but could never buy a big fat plastic tub! I'd like a boat I could tour in with a squeeze if required but would be good for day trips in rough water. I'm thinking either a standard Njord or Frej or even a slightly longer Frej (530cm) if you think there would be speed benefit? I would like a light boat and will probably omit hatches (whitewater touring style). I'm thinking of stripping in thin (4mm) light weight ply because it would waste less material when cutting strips and could be stronger. Having built plenty of slalom boats with foam cores, vacuum bagged with 3 layers of Kevlar and carbon I understand the value of a light core. I've never built a strip planked boat so need your advice on if ply strips would work or if I should just find a local, light timber? Also, is it worth having 2 outer glass layers on the hull? What about 's' glass over 'e' glass - stronger for the weight? I'll not be finishing bright. Weight, performance and longevity are more important than the wood look for me. Although I may feel different about the deck once it's all done! Getting excited, thanks for your time. Oh, I assume you can post to Australia? Giving advice on choosing a kayak is a delicate matter, which I try to avoid – apart from some general guidance. But with your comment, I feel confident to be a little more specific. I am 183 cm/83 kg and I divide my time at sea between playing (low-flying over exposed rocks and shooting gaps on wave-fronts, surfing through rock gardens etc) and serious cruising (I frequently go on 1-2 weeks tours along the coast) – both activities combined with a lot of surfing, bracing and rolling. My old Njord (the prototype) is still my favorite for all this. It is very maneuverable in tight quarters, but very fast in all kinds of weather conditions (not top speed, but a high mean speed with surprisingly moderate muscle power over long hours in the cockpit). The initial stability is not very high, but the secondary is (nobody capsizes from an upright position, but when leaning or being pushed too far into the secondary stability range). A lower initial stability is an advantage for many reasons: it leads to easy and easily predictable movements in confused waves and it enables the paddler to control the kayaks orientation on waves (whereas the righting moment of much stability forces the kayak parallel to the water surface of every wave). 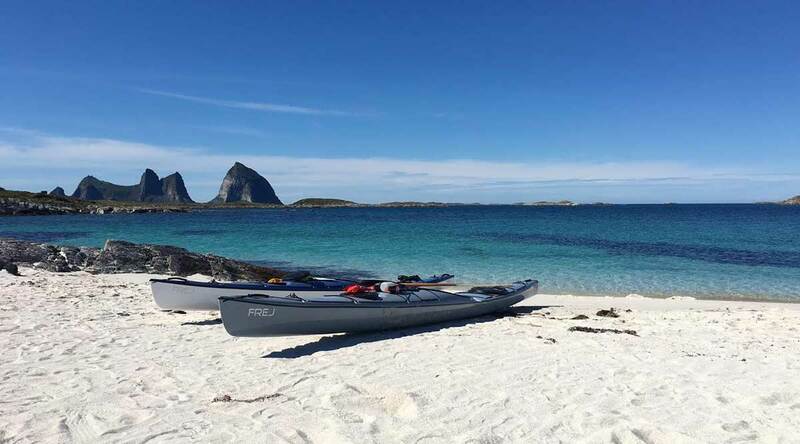 The Njord is a medium volume kayak, best suited to paddlers used to traveling light, and thus enjoying the advantage of a lighter more responsive kayak – and the benefit of a kayak that performs as nicely with or without load. Choosing between Njord and Frej is hard since Frej is a just a wider and shorter Njord with a slightly higher foredeck. This means that you trade a little cruising speed for a little more maneuverability – and inexperienced paddlers like the higher initial stability. But to me, Njord wins hands down. I love the daily runs of 35-45 NM with full camping load and in all kinds of weather and sea conditions, and the stability curve suits me perfectly: the easy movements are less tiring than the somewhat jerky movements of a really stable craft. The secondary stability is there should anything extraordinary happen – I can lie down on a static brace without the paddle and hands above the surface (with full load). I can roll the kayak both ways, empty or fully loaded, with the paddle or by hand. In essence, Njord and Frej are the same but Njord is slightly more aimed at serious cruising and Frej at play – but the difference is rather slight. But Frej has a touring pace on par with most commercial touring kayaks and Njord is more maneuverable than most kayaks of its length. The most commented difference is that Frej feels initially more stable. I have a couple of comments on your building ideas: while I like the idea of no bulkheads/hatches and have done years of serious touring in such kayak (things that are not there weigh nothing, cost nothing and don’t break). But with Njord and Frej, the aft deck is so low behind the cockpit (to make rolling and bracing super easy) that it is very hard to use the aft volume without a deck hatch. And since I prefer a small ocean cockpit it would for me also be hard to pack up front efficiently. I am not very fond of using plywood as strips. Material waste is approx the same as with solid wood (the width of the saw blade), plywood is generally heavier than solid wood (fir, cedar, paulownia etc) and it is not as strong (since half of the layers will be in the wrong direction for the expected load – the important function of the wood is to provide good longitudinal tensile and compressive strength, while the glass/carbon/aramid is there to add the transversal strength that ribs do in traditional boat building, to distribute impact loads over a larger area and to seal the hull). The wood is not just a core but an important structural member. A lighter core is tempting (foam, balsa), but if you end up having to increase the outer layer to compensate for the lack of core strength, it would mean to save on a density 0,3-0,45 material by using more of a density 1,4-2,0 material. To keep the weight down (a Njord built with an eye on weight should come out at approx 15-17 kg including bulkheads, hatches, adjustable skeg etc) I would use one layer glass, doubled just along the keel, sheer and stems and in certain areas mentioned in the manual (under the aft deck where you might sit entering, under the heels for wear, in the cockpit where you put your feet entering and exiting, under the fore deck where you might pull a waterlogged kayak in a rescue situation etc). S-glass is in my experience not worth the extra cost and work. It is harder to wet out, not as flexible and therefore difficult to drape over the curved surfaces and the extra tensile strength does not increase the strength in the completed structure more than marginally. My compliments to a very impressive answer and advice. I was struggling with the same question - Frej or Njord. Delicate choice between two good alternatives, from my point of view. I ended up in bying Njord drawings and material, but the building has not yet started for several reasons. Njord it is for me too! Thanks Bjorn. Intressanta kurvor där du jämför Frej och Njord. Jag har sökt efter en lättdriven kajak för långtur (HBB). Jag har letat bland de långa skroven för att hitta en "snabb" kajak, men har nu tänkt om. Förra året använde jag en 580 cm lång kajak men jag tror inte det är optimalt. När jag gör långa dagsturer med packning kör jag för långsamt för att dra nytta av det långa skrovet. Igår jämförde jag tre kajaker en 500, en 540 och min gamla 580 cm lång. Alla har i princip lika lång vattenlinje som kajaklängden. Jag packade ner dem med 40 kg och testade farten vid samma puls. För att göra det rättvist så körde jag en omgång på förmiddagen och en på eftermiddagen i omvänd ordning så att pigga armar inte skulle påverka testet. Jag körde på låg puls i ett tempo jag håller på en heldagspaddling. Klart snabbast eller snarare mest lättdriven var den kortaste kajaken. Så allt talar för att mitt nästa kajakval blir en kortare kajak i samma längd som Frej. Jag är i vart fall inte tillräckligt stark för att orka driva ett långt skrov på heldagsturer med packning. Igår var det ganska mycket vind och den största vinsten var i motvinden när mycket kraft gick åt i vindmotståndet. Hur ser du på egenskaperna i lite högre sjö vad gäller kortare kajaker? Det skulle vara kul att testa Frej. Får passa på om jag har vägarna förbi Petrus. Dina iakttagelser är helt riktiga. Långa kajaker har generellt högre toppfart, men inte sällan högre friktion i lägre farter. Men det går inte att koppla en egenskap så direkt till en enda parameter. Det är lätt att hitta exempel på korta kajaker som har högre toppfart än långa och långa kajaker med lägre friktion i lågfart. Kajakdesign handlar om att väga ihop en mängd olika, och inte sällan motstridiga, parametrar till en välbalanserad enhet med de egenskaper man önskar sig. För just fart är längd/breddförhållande (Frej 9,4 – Njord 10,9) och Pc (Frej 0,52 – Njord 0,56) viktiga. Men även kursstabilitet/manöverbarhet/långskeppsbalans (hur mycket kraft man måste lägga på styrning) och stabilitet (hur kajaken rör sig i sjön; stor initialstabilitet ger större rörelser och mer turbulens kring skrovet) påverkar den praktiskt användbara fartpotentialen. I vanliga paddelsammanhang är det ingen större skillnad mellan Njord och Frej i farthänseende. Båda är lätta att hålla jämn och bra fart med i en paddelgrupp, oavsett om gruppen består av starka paddlare eller inte. Förlåt jag var otydlig. Kajakerna jag testade var systermodeller i två storlekar så längd/breddförhållande var säkert ganska lika. Vid första testet höll jag 8,1 km/h med den kortare och 7,8 km/h med den längre. På eftermiddagen då jag repeterade testet hade det blåst upp så jag fick kraftigare motvind. Då höll jag 7,6 med den korta och7,2 med den längre. Eftersom jag paddlar uppåt 13-15 h/per dag skulle skillnaden bli upp emot en halvmil om dagen. Som långpaddlare värdesätter jag att en kajak är extra lättdriven när jag är trött eller har motvind en hel dag. Om kajaken i dessa situationer känns trög blir den psykologiska effekten väldigt stor. När jag är stark eller har medvind går det som regel lätt bara jag sitter i en hyfsat lättdriven kajak. Jag söker vidare efter min optimala farkost! Som jag förstår det så ska jag sträva efter ett lågt pc tal men hög marschfart. Dt skulle väl innebära en lättdriven kajak i farten 7,5 till 8 km/h och hellre glida lätt tunga dagar i 7 km/h istället för att prioritera maxfart. Då ser Nanoq ut att klara sig bäst bland dina kajaker. Jag kanske ska testa en Qanik. Nanoq hamnar någonstans mellan Frej och Njord i praktiken. Som jag skrivit på olika ställen är fartsiffrorna från början de teoretiska som designprogrammet tillhandhåller, för att sedan justeras efter praktisk erfarenhet. Siffrorna gäller också för den valda lastkapaciteten: 135 kg för Frej, 130kg för Njord och 125 för Nanoq (i jämförelsen mellan Frej och Nanoq har Frej alltså 10 kg mer last att dra på). Men försök testa både Frej och Nanoq/Alleq/Qanik. Vad är skillnaden mellan original Frej och nya 534? Kan man bygga 534:an utifrån byggbeskrivningen? Nej. Frej 534 är en helt kommersiell produkt, framtagen för glas/kolfiber-produktion. Det finns skillnader både i längd, bredd och höjd, förutom sittbrunnens storlek och skottens placering. Original-Frej är ritad som en snabb, trygg, sjösäker och lätthanterad kajak för paddlare upp till ca 190 cm, 95 kg och 45 i skostorlek. Lastkapaciteten (135 kg) räcker för rimlig långfärdslast även för paddlare i den övre delen av intervallet. Jag är inte odelat positiv till den större 534, eftersom jag vet att en hel del paddlare som egentligen passar bättre i 504, kommer att välja den av slentrian eller i den felaktiga tron att en större kajak är säkrare eller bekvämare att sitta i, och därmed gå miste om del av de fördelar Frej kan erbjuda. Men det är självklart viktigt att kunna erbjuda 534 för dem som faktiskt inte får plats i 504 – men jag har inga planer just nu på att ta fram en större Frej som hembyggeprojekt. Däremot kan den liksom övriga kajaker förlängas eller förkortas efter behag, och anvisningar för detta finns på ritningen. I have set my mind on building your Frej, but I am limited in construction and storing space (my garage is 5.10m in diagonal). On the other hand, I am a bit on the heavy side: 1.80 m for 90 kg. Do you think there would be drawbacks on shortening the Frej to around 4.80 or 4.90 m for my stature ? I am not an expert paddler, however I mainly intend on using it for 1/2 day to day trips in southern France where I live: on the (rather peaceful) Mediterranean, on the Rhone river, in canals, etc. Hi Axel, a Frej at 480 cm will have a load capacity of 127 kg, instead of the standard 135 kg – more than enough for day tours. Traveling light, you may even take a short Frej on multi-day tours. Right, 7kg in load capacity is not a big difference. Let me check about wood availability and I'll get back to you to order the plans. Bjorn, forgive me if you have already answered this questions but how many 19mm (3/4") strips are needed to build a Frej? Thank you! I have bought the plans for your Frej, but am becoming interested in surfskis. Would there be any drawbacks to building with a surfski cockpit, and under hull rudder? I am 1.85m and 85kg and have made the stations for 100% scale. The hull itself is very suitable for a surfski modification. The disadvantage is that the deck is lower than on a surfski (since it is assumed that a spraydeck is used) and it will thus be wet. A good drain is recommended, as is a decent size rudder (preferably under the hull – those are much more efficient) if the surfski-frej is to be as maneuverable off the wind as a real surfski. Jag vill gärna modifiera ett omdöme i min utvärdering av FREJ. Det gäller detta påstående: "Kajakken er derfor helt avhengig av senkekjølen selv i moderate vindstyrker." Nu har jag paddlat FREJ 60-70 turer sedan jag skrev det, och blivit van vid kajakens reaktionsmönster. Nu använder jag sällan skäddan, lika sällan eller kanske mindre ofta än när jag paddlar min North Shore Atlantic. FREJ reagerar väldigt responsivt på små korrigeringar av kursen med hjälp av höft och paddel. Jag skulle ändå aldrig bygga en FREJ utan nedfällbar skädda. Den är väldigt nyttig att ha när man surfar. Tack Torleif för förtydligandet. Det stämmer bra med mina erfarenheter. Vi är också överens om att Frej skall ha en justerbar skädda – det finns alltid och för alla kajaker kombinationer av vindriktning och vindstyrka där skäddan är skillnaden mellan en lugn neutralstyrd kajak och en som kräver råslit med paddeln på ena sidan och sänkt fart. Surf däremot är en fråga om tycke och smak: antingen skäddan nere och enklare styrning men nackdelen att det kan vara svårt att häva en påtvingad gir, eller skäddan uppe och mer jobb för att hålla kursen men bättre manöverkontroll om det kniper. Enig med dig i båda scenariene du beskriver med användning av skädda Björn. Vid surf har jag själv valt att fälla ned skäddan för att lättare kunna fånga de vågor som jag måste ge järnet för att få tag i. Då är det skönt att lägga all energien i framdrift och slippa tänka så mycket på riktningen. Jag är ny till paddling och undrar om man kan modifiera den bakrepackluckan (göra den längre) Då jag gärna vill kunna få med min hund på turer (väger 18kg) Vill ha en lekfull kajak eller måste jag gå på en K2? En kajak har liten volym och blir därför känslig för viktfördelningen. Men i övrigt är det inget problem med en stor packlucka för en hund. Ett par nackdelar finns: du kan behöva lasta lite fram för att få jämvikt, annars kan kajaken bli svårhanterad, och ju större lucka desto svårare att få den tät. Men kontakta Petruskajak i Tranås – han har en "hundversion" av Sommen (scrolla ner till "Hundkajaken"), som är en lätthanterad och pigg kajak som du kan köpa, hyra eller bygga själv på en 8 dagars byggkurs hos Petrus. Den har en extra sittbrunn för hunden och där passar ett transportkapell när inte hunden är med. Vad är skillnaden i designen mellan dina Nordr S och Frej. Kajakerna utgår från ungefär samma kravspecifikation, men den generella skillnaden är att Nordr S därefter diskuterades fram mellan mig, beställaren, marknadsföraren och tillverkaren – medan Frej följer den ursprungliga önskelistan helt. Nordr S är därför en lite urvattnad version av Frej, lite mer Mädchen-für-alles, middle-of-the road, lite mer kommersiellt appeal på en global marknad men lite mindre spännande att paddla. Estetiskt ville beställaren pimpa Nordr med färger och skulpterade veck i laminatet, medan på Frej var vi (Struer och jag) överens om att formen och linjerna är ett fullt tillräckligt designstatement. I praktiken är Frej lite lättare och mer manöverbar (jag fick rita bort lite manöverbarhet på Nordr eftersom beställaren ansåg att roder var en kommersiell nödvändighet), mer lätthanterad i sjögång (det lägre däcket och tajtare sittbrunnen ger bättre kajakkontroll – men inte gångbart på vissa marknader enligt Nordrs beställare). Vidare lastar Frej lite mer, dels genom att den är lättare och dels genom mindre volym i sittbrunnen och mer i lastutrymmena. Farten är ungefär densamma (Nordr tjänar på högre PC, Frej på lägre vikt). Initialstabiliteten är aningen bättre i Frej eftersom paddlaren sitter lite lägre i vattnet (mer krökning i kölen) vilket tillsammans med sittbrunnskonfigurationen kan ge en större trygghet i grov sjögång. Här är en bild som visar skillnaden på skroven (Nordr i rött, Frej i blått). Som helhet är Nordr S en mycket lyckad kajak – men Frej är ännu bättre. Diskussionen ovan gäller kompositkajaken Frej från Struer. Bygger du själv i trästrip/epoxy minskar vikten ytterligare med flera kilo, vilket ger en snabbare, piggare, ännu mer manöverbar kajak med ännu mer lastkapacitet. köpte en begagnad Nordr S och har nu njutit av tre dagsturer. Ja, njutit! Är ingen erfaren paddlare och läs gärna med det i åtanke. Tycker du skapat en väldigt fin kajak med Nordr S, den är smidig och lätt att manövrera, håller bra fart och vill gärna ta fart nerför en våg. Storleken räcker bra för mej (180cm/85kg) för dagsturer och enstaka övernattning. Veckolånga turer är inte aktuellt just nu. Din inställning om att inte välja för stor kajak borde få större spridning! (För) stora kajaker blir sällan någon njutning att paddla. Sen förstår väl alla att den som ska vara ute i flera veckor har ett packbehov som kajaken måste klara. Seabird som kajakproducent har låga priser och ska bedömas därefter. Det blir inte ok att jämföra med en hantverksmässigt byggd kajak för dubbla pengarna. Men det är synd att tillverkaren lägger pengar på roder OCH skädda när kajaken fungerar så bra med skäddan och rodret med fördel kan lämnas på land. Stort Tack för en väldigt trevlig kajak! Är mitt uppe i mitt Frej bygge, och börjat kolla lite på sittbrunns storlek. Är jag bara löjlig om jag gör den 60x40, det är ju inte så stor skillnad från 50x40?. Jag baserar mina teorier på när jag testade din BP i somras, den var i trängsta laget.Så den egentliga frågan är väl kanske om din sittbrunn är 50x40 på din BP. Eftersom däcket på en Frej är högre kanske inte en 50x40 känns så liten, det blir ju en annan vinkel ner i brunnen. Min BP-sittbrunn är 38x52 cm. Men Frej är en helt annan sorts kajak när det gäller volum i sittbrunnen (se tvärsnitt – Frej i blått, min egen BP i rosa (gjord för mina 185/85, men BP-måtten kan skilja beroende på vem den är ritad för). Du har visserligen inte angett hur lång du är eller skostorlek, men det skulle förvåna mig om du tycker att Frej är trång. Det är inget större problem att förlänga sittbrunnen lite föröver. Du vinner ingenting på det (inte lättare att komma i och ur och inte mer plats för knän och fötter), men det innebär inte heller några större problem. Skall du förenkla i- och urstigning behöver du öka till någonstans kring 80 cm längd, och acceptera en del andra nackdelar. Givetvis gör jag en 50x40 brunn, förstår att det inte är några fördelar med ett mellanting. Men nu har jag en annan fråga,. I byggbeskrivningen står det att jag skall ha smalare ribbor när jag gör däcket. Jag kan inte hitta den infon på ritningen, som du nämner. Tacksam för svar, och jag är ledsen om jag missat det. Tusen tack för all vägledning, Micke. Det står att du med fördel kan använda ett par smalare ribbor vid övergången skrov-däck. Framför allt på akterdäcket är det en stor fördel. Bäst är om du klyver en 20 mm ribba med sågskäret lite vinklat, så att du får två trapetzoidformade ribbor, ca 9 mm ribbor med med en rak och en vinklad sida. Om du vänder den ena för-akter får du två bitar som snyggt tar upp den snäva radien vid akterdäckets reling. Men står det någonstans att hela däcket skall ribbas med smalare ribbor, är det något jag missat. I så fall är jag tacksam om du kan berätta var så jag kan korrigera. Ritningen visar inte hur ;). tusen tack så länge, Micke. Jag har förtydligat i byggbeskrivningen och skall lägga in skiss på Frejritningen. Frej är ett gränsfall – men jag föredrar att använda smala ribbor även på Frej. Skrov-däck-skarven blir lite snyggare – framför allt bakom sittbrunnen. Jag brukar klyva en bordläggningsribba med sågblader vinklat ca 15 grader. Då får jag två ribbor ca 8-9 mm breda med en vinklad långsida. Den ena ribban vänds för-akter och underlättar att få däcksradien fri från glipor. Håller på att avsluta ribbningen av däcket på min Frej. Vilket innebär att jag redan håller på att planera dom nästa stegen. Har du något tips om hur man går till väga med det integrerade ryggstödet som finns på ritningen. Hur formar jag profilen du har ritat ut på ett smidigt sett? Vad är bästa material valet till det? Jag tänker göra en åvanpå liggande sargkant i glas och kolfiber till sittbrunnen. Det är väldigt svårt att återge en komplicerad 3D-form på ett tvådimensionellt ritningsblad. Dessutom krävs en individuell utformning för att önskvärd komfort. Ett relativt enkelt sätt att få ordning på kurvaturen är att limma ihop fem 10 cm skumskivor vertikalt, med mittelbiten formad efter ritningens sitsprofil. Forma sedan botten så att den passar i kajaken. Sedan skär och slipar du fram en komfortabel kurvatur i de övriga skivorna – med ideliga provsittningar för att inte tappa formen. Ett annat alternativ kan vara att använda PU-skum (och en lös profilmall för att guida till rätt form). När du är nöjd med formen kan du antingan använda skumsitsen som den är, klädd med ett tunt liggunderlagmaterial, eller laminera den i glas- och /eller kolfiber och antingen behålla skummet som stöd eller ta bort och använda enbart laminatet (då krävs 12-13 lager 165 gr väv). En enklare lösning kan vara den sits/svankstöd jag fixade på Black Pearl sedan den ursprungliga lösningen havererat. Hej igen Björn, och tack för alla dina svar på mina frågor. När jag läser om kajakbyggen lite här och där, så dyker det ofta upp att man skall ha en däcksbalk bakom sittbrunnen för att kunna sitta där, vid istigning och självräddning. Måste jag ha det på min ribb-Frej eller S&G BP? Jag har givetvis dubblat väven där du säger det, 40 cm bakom sittbrunn och skall göra likadant på BPˋn. På stripkajaker med välvt akterdäck räcker det normalt med akterskottet och dubblering av väven – men man kan även komplettera med ett par 5 cm kolfiberremsor med en decimeter mellanrum bakom sittbrunnen. På BP med tunt, plant däck blir belastningen lite större, och skottet kan fungera som brottanvisning när man belastar däcket bakom sittbrunnen. Jag brukar limma dit en balk ca 20 cm bakom sargen för säkerhets skull (för att spara vikt är balkens undersida bågformad, ca 18-20 mm hög midskepps och tunnar ut till bara ett par millimeter ute vid relingarna). Ett enkelt alternativ kan vara att laminera in en eller två "balkar" av PE-skum bakom sittbrunnen – eller som många gjort (och det verkar räcka): några smala remsor kolfiberväv på tvären bakom sittbrunnen. Funderar på att beställa ritningar till en Frej men undrar om det är en för stor kajak för mina 69 kg? Nej, det fungerar bra, men är på gränsen. Paddlar du den tom kommer den att flyta aningen högt, vilket innebär att den är mer manöverbar än tänkt och att du får jobba lite med vindpåverkan. Med lite last för turer hamnar du rätt. Du kan om du vill kompensera genom att korta kajaken några centimeter. Konsekvensen blir då att du sänker toppfarten med någon procent, medan du får lägre totalt motstånd i marschfart och att den blir lättare att hantera när det blåser. Minskar du avståndet mellan spantnmallarna när du sätter upp bygget, får du en 13 cm kortare kajak med med 5 kg mindre lastkapaciteten. i am interesting in building a Frej. Because i have a CNC router, can i buy the plans and the CAD files of the kayak? if yes what is the extra cost? I can ship the plans as usual and mail the station molds file (dwg). No extra cost. Jag skall efter snart 30 år i en P&H Baidarka införskaffa en kajak till. Har ingen ambition att bygga själv så det blir något färdigt. Testade Frej 504 lite kort på Stockenträffen förra året och tyckte den kändes mycket rolig att paddla. 1 - om du skulle jämföra Frej med Qanik från Seabird, vad är de huvudsakliga skillnaderna i hantering? 2 - Jag är 180 cm och väger mellan 85-90 kg. Vilken längd på Frej skulle du rekommendera och varför? Tack för en mycket intressant och rolig site! Prøvesatt en Frej nylig - men synes den var litt vel trang (den er tilpasset en av samme høyde, men en mer slank person enn meg). Vil det være mulig å tilpasse Frej eller Njord til en på 185cm, str 44-45 i sko og 120kg? Bruksområder er dagturer, helgeturer, motion - så ikke all verden av opp-pakning, men fint om det kunne vært mulig med en enkel overnatting. Kontaktsidan försvann tydligen i samband med en uppdatering för ett tag sedan. Den är återställd nu – tack för påpekandet! Jag är på gång med ritningar till ett par nya versioner av Frej – en lite mindre (S) och en lite större (L). Den större bör passa dig utmärkt. Men jag har väldigt mycket igång just nu så det tar ett litet tag innan de är klara att presenteras. Jag lade just en beställning på en extra lisence, glömde nämna att det var på en Frej. I wanted to let you know, that I actually started the preparation to build the Frej. The Strong Back Profile is orderd and the laser cutted cross sections arrived yesterday! I hope you don't run into trouble with the CNC-cut parts, considering my drawing are done with manual workmanship precision in mind, not with CAD/CAM precision. The biggest advantage for me utilizing lasecut is the speed and the fact, that I will NOT produce a trash bag full of dust. A cleaner workshop is definitly an advantage! I ordered a Aluminium rectangular tube to be the strongback - it should be delievered on the 19th of December. Than I will place the section and we will have a first look of the Kayak. In general - utilizing new technolgies like lasercut or 3D Printing should lead to better results and make life easier :-) - So just do it! It is not so futuristic as it might look! First-time making anything more complicated than an MDF bedside cabinet. Excellent design. But a few errors in the execution. The result, though: A kayak that feels great to paddle.